The Longevity of Breast Implants: Do They Have To Be Replaced? I see a lot of patients for breast surgery. It is a significant part of my practise. I do both cosmetic breast surgery and reconstructive breast surgery. One of the questions that I often get from both groups is how long will my implants last? I tell my patients that we really don’t know. In general, they are very robust. There are YouTube videos of plastic surgeons driving over implants without them rupturing. I myself have done lots of surgery on patients who have had implants in for 30-40 years. When I remove them, they are often perfectly intact. And those are often the old liquid silicone implants. If implants from that long ago have lasted, who knows how long today’s technologically superior breast implants will last. What are the differences between silicone and “gummy bear implants”? The history of breast implants in Canada has seen a lot of different implants over the last few decades. The breast implants available on the market before 1992 were liquid silicone or saline. If the liquid silicone were cut in half, they would pour very slowly like cold honey. From 1992 until 2002, there were no silicone implants on the market in Canada, only saline (which incidentally are a silicone shell that holds saline). During this time, the major manufacturers did a lot of research to design a better implant, and the scientific world spent a lot of time making sure that breast implants were safe. After 2002, silicone breast implants were re-introduced. However, the new models of implants were with cohesive gel. Essentially, the cross-linking of the silicone made them a solid device, not a liquid. If you cut them open they will not leak. They are commonly referred to as “gummy bear” implants. Much like if you cut a gummy bear in half, you would see the inside but it would not leak any gummy material. Again like a gummy bear, even if the outer shell is breached the inner content is the same material. The amazing thing, is that despite being a solid they still feel soft and natural. The amount of research and testing required to introduce cohesive gel implants into the market was staggering. So, from a safety perspective they are tremendous. Regarding longevity, I think it is really hard to estimate how long they will last. Ten years seems to be a number that people throw around, but I don’t know what people are basing that on for cohesive gel silicone implants. Do breast implants need to be replaced post-pregnancy? The two most likely reasons that people may want further breast implant surgery are: one, they develop a capsular contracture that needs to be released; and two, they get droopiness (from pregnancy, breast feeding or weight changes) and want a breast lift. A common misconception that I often hear is that a patient’s implants got smaller from pregnancy or breastfeeding. In reality, the only implants available now that will change size is a ruptured saline implant. Generally it is not a slow leak, but a fairly fast rupture, like a broken water balloon. The most common spot is at the self-sealing port. (When the implant is placed in the breast it is then inflated with saline through a tube. This tube is pulled free from the implant and the port seals over). When a leak happens with a saline implant, the fluid may stay in the breast capsule for a while, but would soon be re-absorbed by the body. It is not a concern if that happens. The saline used to fill the implant is the same saline that would be used in your IV during surgery. With that being said, pregnancy and breast feeding do not affect the implant. What usually happens is that breast tissue swells from hormonal changes and milk production. Any weight gain during pregnancy will also increase the fat volume in the breast. These changes may last several months after stopping breast feeding. At that time the milk glands shrink, and the fat of the breast also generally gets smaller as you loose your pregnancy weight. This results in a breast that is smaller, but often has stretched-out skin resulting in droopiness. To obtain a perky breast in that setting, either a larger breast implant can be used or a breast lift done. There are pros and cons that have to be considered with either option, something I spend a lot of time discussing with my patients. How do you fix droopy breasts? 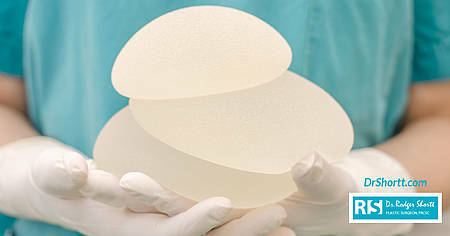 A slightly larger breast implant may fill the lax tissue and give a little bit of lift. However, I would caution people not to go too large with the implant. The bigger they are, the harder they fall! For women that have droopy breasts, quite often the tissue has become lax and is not ideal for keeping an implant “up” if it is too heavy. This would result in further stretching of tissue and a recurrence of the breast droopiness. The other option is to do a breast lift. There are several ways of doing this procedure, depending on how much lift is required. The obvious goal is to minimize the scars. The breast lift can be done without changing the existing implant, should you wish. So my advice to patients is to enjoy your breast implants! Get a regular mammogram or ultrasound screening as advised by your family doctor, based on your age and risk factors for breast cancer. If you have a concern about your implant, go and see your plastic surgeon. I don’t think that anyone needs to change their implant just because it is X years old. To me that sounds like a cash grab. If a problem arises, do it then. Otherwise spend your money on something fun. As your Granny would say, “Don’t trouble trouble, until trouble troubles you”. . If you are interested in learning more or having a private consultation please click here or telephone 905-849-4282. Dr Rodger Shortt strives to be the best aesthetic, reconstructive and cosmetic plastic surgeon. He is committed to providing high quality patient care and achieving excellent results. He is considered one of the top plastic surgeons and one of the few plastic surgeons in Canada that has the top rating of five stars in Realself, Rate MD, and Ontario Doctor review. Dr Rodger Shortt is a specialist plastic surgeon who graduated from Queen’s Medical School in 2004 and became certified by the Royal College of Physicians and Surgeons of Canada in 2009. He received further sub-specialty fellowship training with international plastic surgeons in micro-vascular breast reconstruction, cosmetic plastic surgery, and body contouring after bariatric (gastric banding) surgery, significant weight loss or post-pregnancy. He is the Director of Cosmetic Surgery Training at McMaster University and an Assistant Clinical Professor. If you are interested in a consultation with Dr Shortt please contact 905-849-4282 or through www.drshortt.com.